Bailey Southwell & Co. 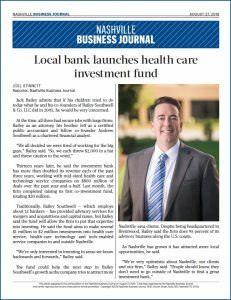 Featured in the Nashville Business Journal | Bailey Southwell & Co.
We are excited to have the Bailey Southwell & Co. origin story told in the pages of our hometown Nashville Business Journal. The piece, by reporter Joel Stinnett, tells about our modest entrepreneurial beginnings in 2005 and some of four recent successes – and also notes the recent launch of BSC Capital Partners investment fund. As noted in the story, we love doing business with Nashville-area clients, so please reach out if we can be of service to your healthcare, healthcare technology, or tech-enabled services business. Teeing it Up with Bailey Southwell & Co.